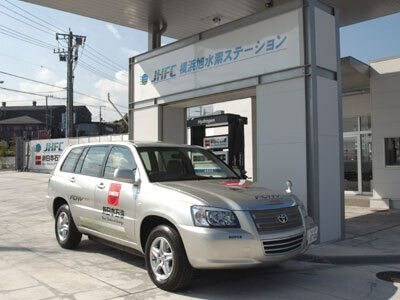 Japan’s Nippon Oil is working on a new tanker that it hopes will be ready soon (relatively speaking – it’s looking to 2015) to transport the hydrogen it predicts fuel-cell vehicles will be guzzling instead of gasoline. Current solutions use cast-iron cylinders that are heavy, expensive and low in capacity. A typical tanker now can transport enough hydrogen for just 60 fuel-cell cars, whereas Nippon Oil’s new tank uses carbon fiber and a compound that can safely absorb changes in internal pressure to hold enough for 300 vehicles. “The relation goes deeper than a substitute for gasoline profits because oil refiners already make large amounts of hydrogen and are in a good position to profit from the transition to fuel cell cars.